An email forwarder allows a copy of an email sent to one address to be forwarded to another address. Note that you can forward emails from a specific email account or all emails from one domain name. These steps show you how to forward all email from one email account to another. Login to your Doteasy Member Zone. Scroll to the Email section and click Manage Email Accounts. This will open your cPanel dashboard. 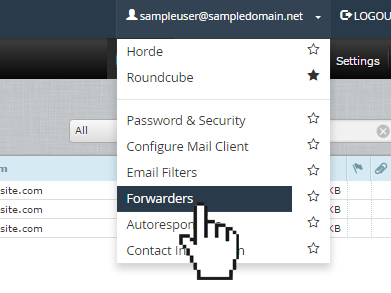 On the cPanel dashboard, scroll to the Email section and click Forwarders. Enter the address you would like to be forwarded. Choose the destination for the forwarded email. Login to your webmail. Be sure to login using the email address and password of the email address you want to setup the forwarder. 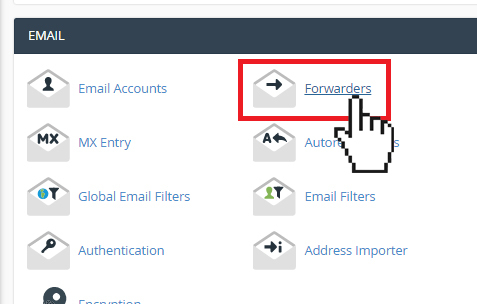 Once you’re logged into your webmail, click on the email address on the top of the page to open the drop-down menu and select Forwarders. 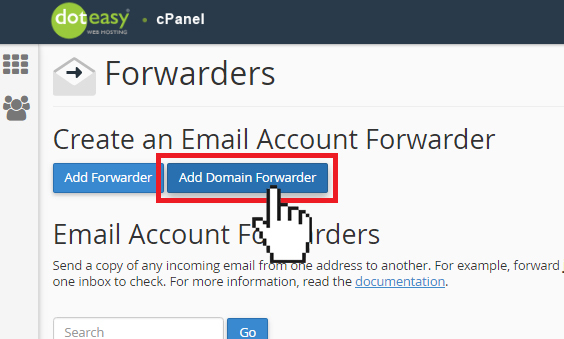 This will open the Forwarders manager in your cPanel dashboard. 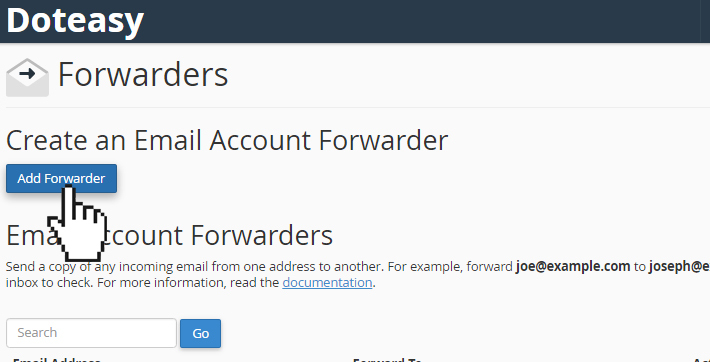 On the Forwarders manager, click Add Forwarder. Enter the destination email address for the forwarded email. These steps show you how to forward all emails from one domain name to another domain. 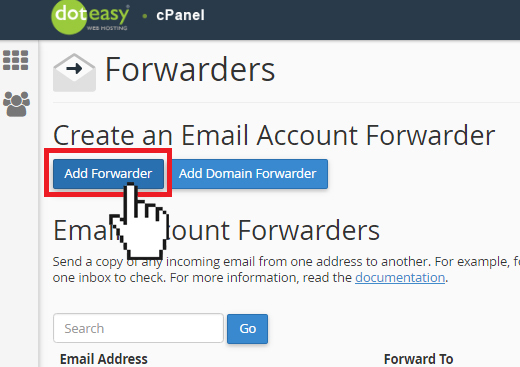 On the Forwarders window, click Add Domain Forwarder. Enter the domain you would like to be forwarded. If you have more than one domain name on your hosting account, simply select the domain name from the Domain drop-down menu. Enter the destination (ie. another domain) for the forwarded email. *NOTE: Domain forwarders will only forward email when the system cannot deliver it to another email address. For example, a user sends an email to john@example1.com. If john@example1.com is an existing email address or has auto-responder set up, then the email will not be forwarded. The email will be forwarded if john@example1.com is not an existing email address or auto-responder.